MORGANS pre 1956 - See RED LION. 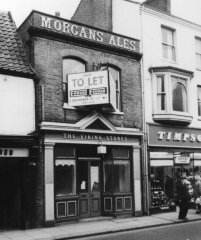 One of two VIKING STORES to operate in Magdalen Street, this one from c1956 to 1961. Located in the former RED LION. Morgans sales for 1960 were 34 barrels of beer, 99 spirits.